Trapping is a fishing method in which fish may be trapped live and uninjured as they swim into small baited cages. Although fish caught by traps can be caught without injury, confinement may be distressing to fish, especially when potential predators approach or enter the trap. Trapped fish are sometimes attacked by predators entering the trap. A New Zealand study found that blue cod caught in a certain design of trap that kept them in water as the trap was hauled in, seemed to suffer less stress than those caught by hook and line. This was despite the fact that the hook-caught fish were generally landed within 10 seconds of being hooked, while the trapped fish may have remained trapped for up to 22 minutes, which was the maximum time interval between raising and setting the traps. Conservation groups consider trapping to have low levels of bycatch relative to other major fishing methods. Marine mammals can become entangled in the lines connecting the traps to the buoys. Green moray eel preys on other trapped fish. Bycatch fish caught in traps can become injured from attempting to escape the trap, from decompression as traps are lifted to the surface to land fish, from handling during landing and from predators, such as moray eels, that enter the trap and prey on fish before the traps are hauled in. 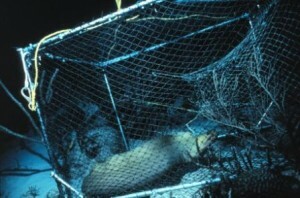 Traps can become lost and can continue “ghost fishing”. They can be fitted with timed release panels to stop them fishing after a period of time has elapsed. Bycatch can be reduced by choice of mesh size. Openings can be included in the traps to release undersized fish. Reduce the time between setting and retrieving the trap (the Fair-fish fish welfare certification scheme limits capture duration to 30 minutes).